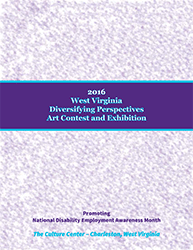 Charleston, W.Va. (Sept. 7, 2016)  The West Virginia Division of Rehabilitation Services (DRS) announces the 2016 Diversifying Perspectives Art Contest and Exhibition award winners. The Grand Exhibitor is Carli Ratliff from Oak Hill for her mixed media painting, "Climbing to the Top." Ratliff photographs the animals and foliage in her illustrations, and paints from her own photographs. She is a 2010 graduate of Concord University, where her studies focused on art and music, and is a 2004 graduate of Oak Hill High School. Ratliff, who has epilepsy, has won awards for her artwork and has been featured for three years in the West Virginia Wildlife Calendar, an annual contest by the West Virginia Division of Natural Resources. Images of all entries are included in the exhibit catalog. Kristie Garrison from Waverley for her mosaic picture, "Peaceful Serenity." Garrison works in the Mosaic department at SW Resources in Parkersburg. Garrison has always loved creating things with her hands. She has been crafting since she was 11 years old. Lieselotte Heil from Alderson for her watercolor painting, "Into the Woods." Heil uses her artistic and musical abilities as a way of celebrating and expressing her joy and gratitude at being alive and healthy after facing health and disability-related challenges. Greg Siegwart from Wheeling for his colored pencil drawing, "Texting." Born in Wheeling, Siegwart’s love of painting began when he picked up a brush at the age of 10. This self-taught artist turned this hobby into a therapeutic refuge after experiencing a traumatic brain injury after an automobile accident in 2000. The artwork selected as the Grand Exhibitor has been incorporated into a poster promoting National Disability Employment Awareness Month, a national campaign that raises awareness about disability employment issues and celebrates the many and varied contributions of America's workers with disabilities. Held annually in October, this year's theme is "My disability is one part of who I am." The poster will be displayed in businesses throughout West Virginia. The Diversifying Perspectives Art Contest and Exhibition is an opportunity to showcase the creative and diverse abilities of people with disabilities and to promote National Disability Employment Awareness Month in October. The contest was open to West Virginia residents with disabilities who were at least 18 years old. The exhibition opened with a reception on Wednesday, Sept. 7, at the Culture Center in Charleston and will remain on display in the Culture Center's Balcony Gallery through Nov. 5. "This contest and exhibition allow us to feature the artistic abilities of West Virginia artists with disabilities during National Disability Employment Awareness Month and plays an important role in bringing awareness to disability-related employment issues," said DRS Director Donna Ashworth. Copies of the National Disability Employment Awareness Month poster are free and available from the West Virginia Division of Rehabilitation Services. DRS proudly presents this contest and exhibition in partnership with the West Virginia Office of the Secretary of Education and the Arts and the West Virginia Division of Culture and History. DRS and the Division of Culture and History are both agencies within the West Virginia Department of Education and the Arts. DRS is the state agency responsible for the federal vocational rehabilitation program in West Virginia. Each year, DRS helps thousands of West Virginia residents with disabilities meet their employment goals by providing individualized work-related counseling, training, job placement and other vocational rehabilitation services through its 30 field offices across the state. The Division of Culture and History brings together the past, present and future through programs and services focusing on archives and history, arts, historic preservation and museums.